Engagement Rings	There are 161 products. Find your dream engagement ring at Macintyres. 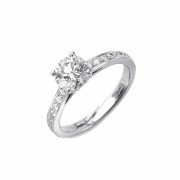 We specialise in fine diamond rings and have one of the largest collections of engagement rings in Edinburgh. Every engagement ring for sale on our website is in stock & available to view or try on in our showroom, where we also have many more styles and loose stones to choose from. Choose from our wonderful range of classic and unique engagement rings, selected by our award winning in-house FGA Gemmologists. Create something unique with our state of the art bespoke design service. Chose a loose diamond or coloured stone from our collection and have a mount created around it. We can design and make a piece of jewellery to any brief or budget. Platinum 3st Diamond Ring - 0.78cts.